L?effetto della vocazione non è solamente temporaneo, ossia ristretto a questa vita, ma eterno, e si estende alla vita futura. (Ms Bg 5963). 1806: Michael Angelo Gramego was ordained a Deacon by Bishop Molin, Administrator of Asola, at St. George?s Church, Verona ? John Marani received the four Minor Orders at the same ceremony. 1807: Fr. Bertoni preached on the theme: ?Holy Easter and the Spiritual Life?. Our life of glory is hidden with Christ in God. 1812: Francis Cartolari was vested at St. Firmus Major by the noble Penitentiary, Christopher Cartolari, with Bishop Liruti?s permission. 1813: In his letter to Mother Naudet of this date, Fr. Bertoni praised the work of Fr. 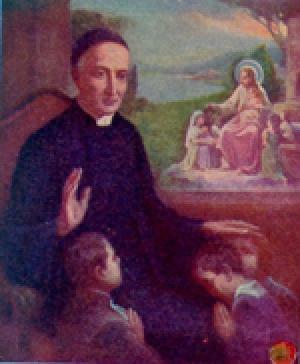 John Louis Fusari, long time Superior of the Oratory of St. Philip. 1838: Fr. Biadego, a Priest of six years, received his first faculties for Confessions, good for six months, with the customary proviso of making the Retreat in September. 1868: Palm Sunday ? Holy week services began at Villazzano. Frs. Lenotti and Vincent Vignola preached a retreat to the community there; Fr. Marani was sick in bed. 1869: Fr. Marani, Superior General, came to Villazzano to stay with the students for a while.